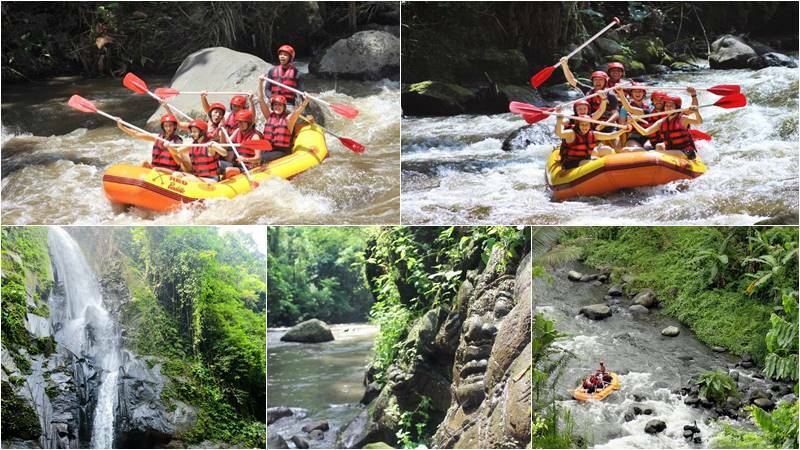 Explore Ayung River in Bali on the most loved adventure tour of the island, a whitewater rafting! Our friendly and skilled raft guides will take you on a thrilling, safe and fun trip by joining Ayung River Rafting Ubud on the most beautiful and longest river of Bali. Don’t miss this fun and family friendly activity, which all those looking for thrills should experience on their visit to Bali, at least once! Buffet lunch and hotel pick up included in the Ayung river rafting adventure. Explore Bali’s best adventure-see the lush rain-forest, waterfalls and stunning gorges. Experienced raft guides – professional and friendly – the most advanced equipment in this business. Suitable for single travelers and individuals of all ages–between 7 and 65 years. Up to IDR 500.000.000 personal insurance cover. Ayung River Ubud has been popular for many years for the white water rafting adventure. The Ayung River is classified in Class II to III but can increase during the rainy season. The scenery along the river is spectacular, and when you raft to challenge the rapids, you can immerse yourself in the beautiful rainforest that borders on the river. Our experienced guides will guide you through your thrilling Ayung rafting adventure for around 2 hours. This is the best way to experience the amazingness of the Ayung River Valley. Are you ready to join the most exciting Bali Adventure in Ubud? Get a private air-conditioned car from your hotel in the morning or in the afternoon and drive into the beautiful Ayung River for an unforgettable rafting experience. When you arrive at our reception, you can enjoy a refreshment while you register. You can prepare for rafting from here, and the locker is free to store your belongings. When you are ready, your rafting guide will take you to the starting point, which will take you around 10 –15 minutes by air-conditioned car. Our traditional lobby is located in the middle of the rice field and you will have a helmet, a lifejacket and a paddle. When you reach the river within a 15-minute walk through rice fields and tropical jungle, your guide will start with an introduction and inform you of the safety procedure and the tips for enjoying rafting. From here you will start your 2 hours adventure – an incomparable and unique way of enjoying Bali’s natural environment. On your tour through the Ayung River Ubud, there are spectacular waterfalls, exuberant rainforests, green paddies of rice, high cliffs and stunning gorges that will bring you wet and wild! Your rafting guides will improve your experience by enjoying yourself with jokes and pointing out the various species of wildlife and tropical plants of the island while preserving your safety. When rafting reaches the finish point, it’s time to rest, take a shower, dressed and ready to enjoy the delicious and savory buffet lunch, served in our duplex restaurant overlooking the Ayung Valley and rice fields. We also have toilet, hot shower, bar and tropical garden with complimentary Wi – Fi internet access throughout. Full fun and great Ayung River rafting adventure with us. 09.30-09.45 : Arrive on the rafting site at Ubud. 10.15-10.30 : Enjoy 2 hours journey on Ayung white water rafting with all of your friend for an unforgettable experience in Bali. 12.15-12.30 : Reach the finish point of rafting. Let’s take a shower and changes. 13.30-14.00 : Transfer back to your hotel. *) The above itinerary is only a rough time calculation, change depending on the pick-up point. Are you ready for this? BOOK NOW via email or easy chat via Whatsapp. Single Travelers will share with others as long as we have a sharing pick up around your hotel. Complimentary pick up for area: Kuta, Seminyak, Legian, Canggu, Jimbaran, Nusa Dua, Sanur, Denpasar and Ubud. Pick up elsewhere can be arranged for an extra charge during the reservation. A cancellation fee of 100% will apply if the tour cancelled on the same day. The pick up point outside Kuta, Seminyak, Legian, Canggu, Nusa Dua, Jimbaran, Sanur, Denpasar, & Ubud will be subject to a transport surcharge. Your booking is absolutely safe, all personal data is encrypted and securely e-mailed. BaliRaftingAdventure.com takes the privacy of your personal data very seriously. Your personal data is used only for the processing of your booking.